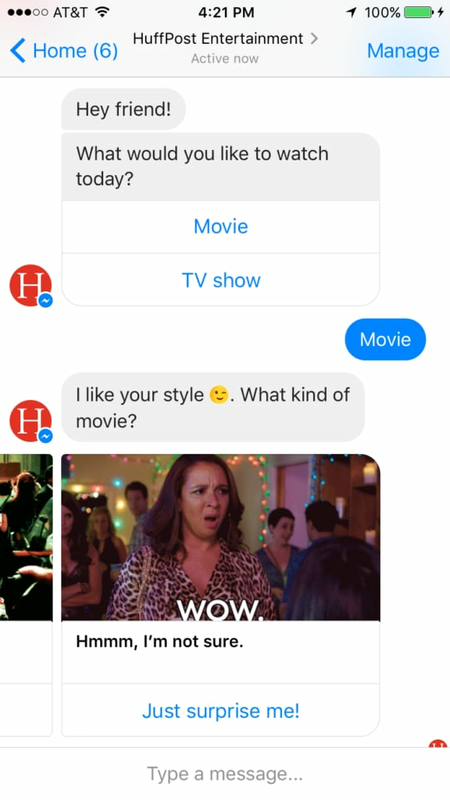 Huffington Post has launched a bot that will help users figure out what to watch on Netflix through Facebook Messenger, TheWrap has exclusively learned. 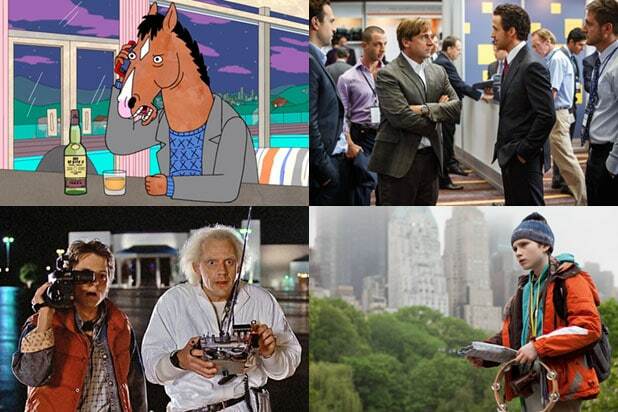 The bot, which is named Felix, gives users recommendations based on what genre they’re feeling that day, whether it be a drama or a comedy – or maybe they just want to be surprised. All of the movie and TV show recommendations that Felix provides are either written by current HuffPost editors or pulled from past HuffPost reviews. “I would call this a ‘what to watch on Netflix’ bot. 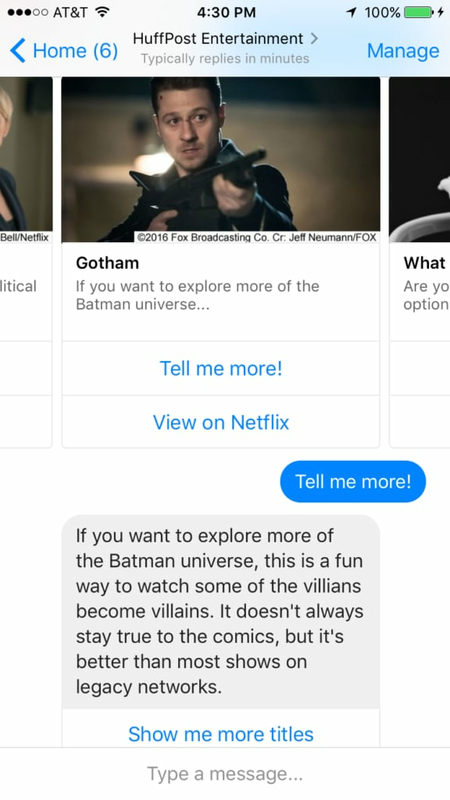 The bot helps people figure out what TV shows and movies to watch on Netflix, based on the genres they are interested in,” HuffPost mobile editor Christine Roberts told TheWrap. “Once a person settles on a recommendation, Felix can also direct the person to that movie or TV show’s Netflix page. Down the road, we hope to expand the recommendations to other streaming services, including Amazon and Hulu,” Roberts said. Roberts explained that her team is always looking for new ways to engage with readers and the Messenger platform offers a great opportunity to deepen relationships its audience on Facebook. 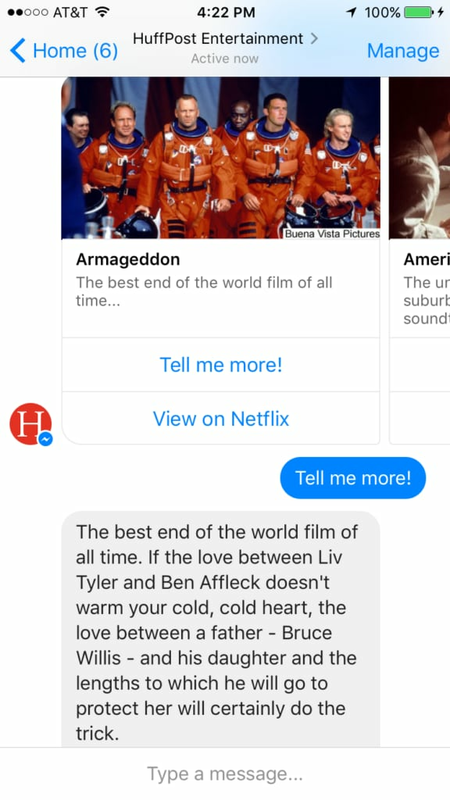 For the time being, the bot will only live on Facebook Messenger, but the HuffPost hopes to expand it to other messaging platforms and perhaps the site’s own mobile app in the future. 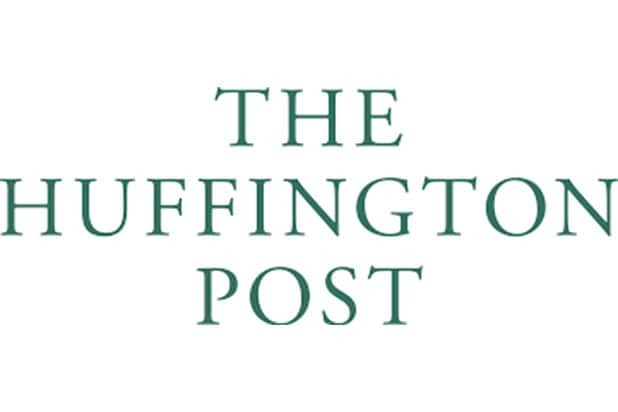 “We have a very engaged audience on our HuffPost Entertainment Facebook page with more than one million followers, so we thought this would be a great place to start. We also wanted to build an experience that was native to Messenger,” Roberts said. Other companies have movie recommendation bots, but this is the first bot that Roberts is aware of that is solely focused on Netflix. The bot is also unique in that the recommendations have been written by past and present HuffPost editors.